Loose electrical connections cause multiple problems in appliances, heat being the most common one. 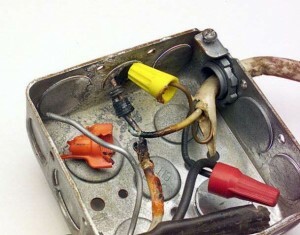 We've all seen burnt wire nuts in a dishwasher power junction box or on a dryer heating element. But how does a loose connection produce heat? Electrical connections need to be mechanically tight to ensure that the resistance across that connection is as low as possible, ideally 0 ohms. When a connection becomes either loose or corroded, it develops resistance. This resistance dissipates power in the form of heat when current flows through it. Even a resistance as low as 5 ohms can produce more than enough heat to burn up the connection and surrounding wires. You can learn more about resistance and ohms in our Fundamentals of Appliance Repair course. In this little video, I show you the effects of a loose connection in a circuit and we'll see how much heat, in watts, a typical loose connection produces. I'm also going to dispel a common myth that I hear, even from manufacturers: loose connections cause a circuit to draw more current. This is completely false and I'll prove it to you. Become an Appliance Repair Rockstar Now! Thank you Scott for this info,I know its information which will come in handy out in the field.